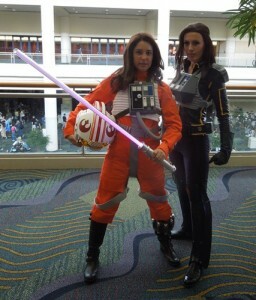 Typically my most favorite moment of any convention is the books panel, because that’s my deepest involvement in the fandom, but for reasons I’ll discuss later… well, let’s just say I am very grateful for all the people who reminded me today why I love Star Wars and gave me the most epic fangirl day ever. 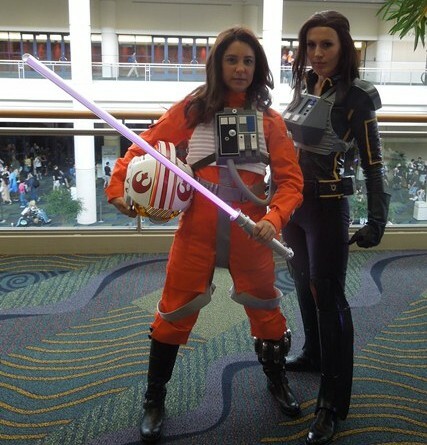 Shea Standefer wore her Suvudu-inspired Stealth-X flight gear Jaina costume to the panel, which meant her traditional orange X-wing jumpsuit costume was going to feel left out. I almost fainted yesterday when Shea offered to let me wear it. Sure enough, it fit great this morning when I tried it on. I took a bunch of pictures, and it was such a thrill. I can’t thank Shea enough for her generosity. After some schedule juggling to accommodate Timothy Zahn’s numerous fans, I sat down with him for an interview at the Del Rey booth in the exhibit hall. 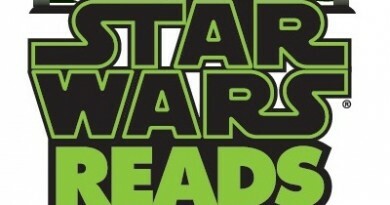 We talked about Mara, Leia, and other strong female heroines, as well as the Fels, the Chiss, and other fan favorites. Tim is always so engaging when he talks about his writing and his characters, and it was a real treat to get to speak to him one on one about his EU work. Look for the interview on the blog in the weeks ahead. 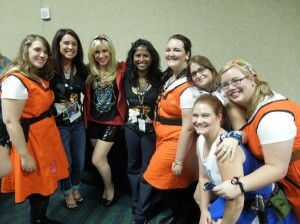 Ashley Eckstein invited me to her Cupcake Party in the afternoon. The cupcakes, of course, were delicious. 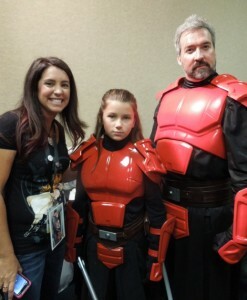 I also got to talk to the Lady Rogues, whom I’d met at Star Wars Weekends, as well as an amazing father-daughter cosplay pair armored up as Imperial Knights. Linda and I got our picture taken with Dave Filoni, who was kind enough not only to sign Skylar’s autograph book, but also draw a quick sketch of Ahsoka, too. What an amazingly kind and generous team they have on The Clone Wars. Right after the party it was off to get in line for The Clone Wars Season Five premiere event. The line was long, but we made the cut. Seeing three full episodes on the full-size digital screen was fantastic – and the high-definition digital quality was amazing. I noticed lots of details I hadn’t seen before on the television at home. The theatrical sound was noticeably different too, although at time the bass was a bit too strong and made the dialogue hard to hear. After the episodes, Dave Filoni and Sam Witwer did a Q&A discussion with Digital Stage host David Collins. The banter was both insightful and hilarious, and you can really tell how much fun they have working on the show. 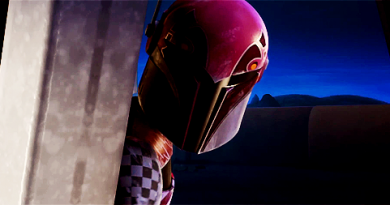 The event ended with the surprise reveal of the extended trailer for Season Five. I won’t give any spoilers, but I have to say it was full of stunning visuals and some genuinely jaw-dropping plot point reveals. I can’t wait for the season to begin – on September 29, at a new time of 9:30 a.m. on Saturdays. After the premiere I went to the lecture hall to listen to Brian Wood talk about his new Star Wars comic, and Leia in an X-wing. After observing the Star Wars Expanded Universe for so long, I can just get a sense of when a writer is going to hit it out of the park. I can’t wait to see where his comic takes the fandom. My convention day ended with a delicious dinner and my first 501st party, where I met some of the very important persons who create the rich details of Star Wars. (I talked Jaina Solo Insider art with Joe Corroney, Suvudu-turned-Essential Readers Companion Jaina-Jag art with Chris Trevas, and the Holocron with Leland Chee!) Plenty of blog topics came out of the day, but for now the bed beckons. I can’t believe Star Wars Celebration is half over. Aw man, I’m super jealous of the jumpsuit…among other things! It’s been my dream to wear one of those since I saw ANH. :) Glad you’re having fun. The cupcake party was amazing! Truly a once in a lifetime experience =3 I had the peanut butter one with a blue crystal on top!